Charles Gordon designed the memorial. He was unable to be present and provided the following words to be read on his behalf. This Memorial is a marker for an early pioneer settler that died and was buried in this area in 1841. 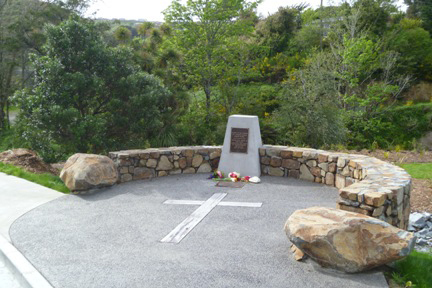 The construction of the Memorial was part of the agreement between the WCC and the local resident group as part of the new Glenside roading into Churton Park. The Memorial sits here along this section of new road. It is semi-circular and acts as a place to stop for those passing by. The strong stone walls that form the outer edge curve around towards the foot path. This creates two arms that enclose those within the gathering space in the middle. The walls also act as seats for those who stop. A Cairn sits at the centre of the memorial. A 'cairn' is a well know type of marker for important places often found on the tops of mountains as markers or memorials. This Cairn acts as a centre focus for the Memorial. It is a marker for the early settler. There is a plaque on it and one on the ground in front relating the history of what took place. As well there is a cross in the centre of the Memorial. The cross is a reference to god and the greater entity once we pass from this earthly place. As you stand in front of the Cairn, you also look out towards the stream and the hills. The stream and the new plantings provide a relationship to the early naturalness of the setting as it may have been in the early 1840's. The Pohutakawa to the side of the Memorial makes a specific reference to this sense of 'nature as it was. It will provide a sense of scale to the Memorial as well as shade once it grows taller. History - Claire Bibby, Past President Glenside Progressive Assn. 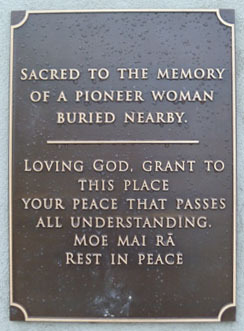 Inc.
Claire Bibby led the project to protect the burial site and have the unknown woman honoured in a memorial. You can go to the menu Memorial History (link here) to read a document of her talk (which explains the history of the site and the project) or to download a .pdf document of her talk. The Mayor spoke of the importance of recognising migrants and thanked the Wellington City Council and Community commitment to work together to get to this point in time. The Hon Peter Dunne spoke of the astonishment the pioneer woman would have felt if she knew that 171 years later, we would be gathered here to honour her. He also spoke of the dedication of a small community over 171 years to keep the burial site of an unamed unknown woman recognised and protected from harm.